For the past few weeks I have been part of a group of beta testers of the new WordPress.com and a new WordPress for Mac desktop app developed by San Francisco–based Automattic (the WordPress-as-a-Service company). The company is part of True Ventures’ portfolio, and its founder, Matt Mullenweg, is one of my dearest friends, so I have an emotional bias. That aside and purely as someone who has been part of the WordPress ecosystem for all of its 13 years, I can say, about damn time. The new software is based on Node.js and uses React framework developed by Facebook. React makes it easy to create cross platform user interfaces. All that means – a better, modern and faster experience with WordPress. One of the biggest knocks on WordPress.com — rightfully so — was that it was slow. The slowness of the WP-Admin interface has been a source of constant consternation for all of us who are WordPress.com fans. As someone who maintains two blogs — ( Om.co and Pi.co) and is part of another blog (P2 for True) — the old way of interacting with WordPress.com was an exercise in patience. I love this new direction. 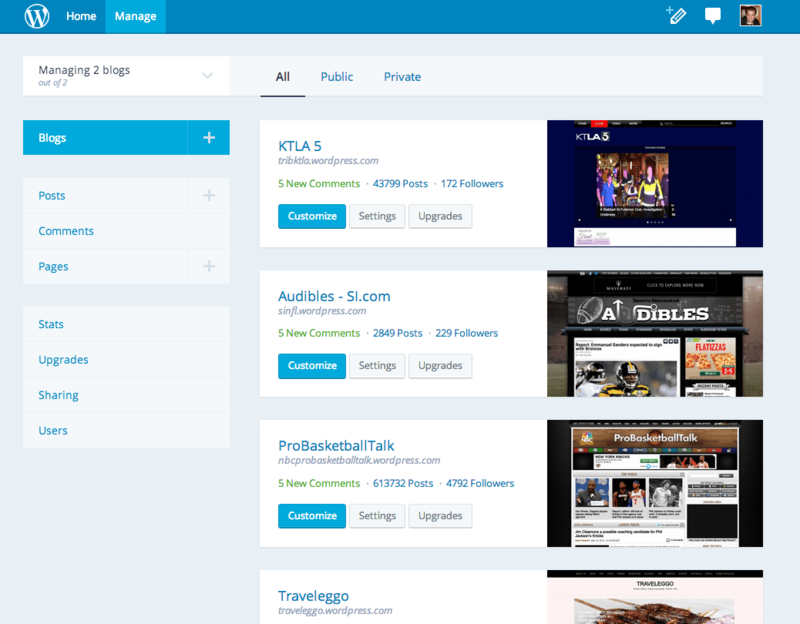 The Automattic team has totally streamlined the long-in-the-tooth WP-Admin interface with this new interface. The new interface for interacting with WordPress.com is simple, elegant, lightweight and, most importantly, rapid-fast. The Mac desktop app is fantastic. Where the company had failed was in keeping up with the times when it came to real-time abilities. Publishing, editing and other tasks were slower, and pages needed constant refreshing. If you had more than a single blog, you had to visit each admin page individually, which was not an ideal situation. Overall, the admin interface was so 2000! In other words, in the past WP hadn’t done a good job of building the real-time experience that we as modern web customers have come to expect. The new upgrade addresses those challenges. It has all the requisite bells and whistles: drag-and-drop image uploads, notifications and social stats, and it’s responsive. What’s more, this new direction allows anyone to build her own interface for WP, making it even more malleable than it is today. I view the shift to this newer, more flexible model as a way for WordPress.com to adapt to become a growing part of the open web. Blogging has always been mistaken for its containers, tools, the length of the posts or just a replacement for the rapid-fire publishing of old-fashioned news. In reality, blogging is essentially a philosophy built on the ethos of sharing. Today sharing on the internet is a major social behavior: We share photos, links, videos, thoughts, opinions, news. Except instead of sharing on a blog, we do the sharing in increasingly proprietary and corporate silos: Instagram, Facebook, YouTube, Twitter, Periscope and LinkedIn. You see, the blogging ethos is alive and well. However, the old blogging tools have to embrace change. Most of those platforms are built to be silos, Facebook and Instagram being the worst offenders. Their approach is a threat to the open web as much as the rise of the app-centric internet. As someone who feeds the monster, I should have the ability to keep a copy of what I create. To stay relevant, WordPress.com has to become not only a publishing tool but also a means for me to route my sharing. Its role is that of an information router. I am looking forward to what talented developers do with the new capabilities of WordPress.com.